Perhaps you have an idea for a business but don’t know where to start. Or you just want to familiarise yourself with new business development fundamentals to help you grow your entrepreneurial mindset for future opportunities. If so, Entrepreneurship101 (E101) is for you. This 5-week online course offers a mix of materials for every style of learning, weekly mentorship from expert practitioners and the tools you need to develop an idea and create your startup all in one place. Start to define your startup idea. Craft your product problem statement and vision statement. Develop your value proposition. Start to identify your customer and test your minimum viable product. Understand your target customer and the size of your market. Start to build out your brand. Learn the fundamentals of financial planning for your startup. Understand the different grants and funding programs out there for your startup. Delve into the legal foundations you will need to know to start your company. You’ll make real progress in 5 weeks. This course is practical, unlike other programs we focus on tactics that (if done right) will accelerate the growth of your company. With a carefully curated a mix of perspectives – you’re not learning business, you’re learning to build a startup with proven methods. Weekly live Immersive sessions and access to our online Slack community of entrepreneurs from around the world, learning to create companies together. While you can learn at your own pace, we’ll be here at I2N to guide you each week. The world around us is changing fast. This isn’t your average course on entrepreneurship. 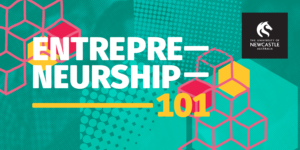 Developed by MaRS Discovery District in Toronto, Canada, the E101 program has connected experts with deep experience from many fields – across sectors and specialisations – to help you see the patterns and opportunities where others see chaos. Let’s advance the world together. MaRS has accelerated the growth of thousands of young companies since launching the E101 program in 2016 whose technologies and solutions meaningfully improve lives every day. This program is now available in the Hunter region (and beyond) to help entrepreneurs realise their potential. The University of Newcastle’s Integrated Innovation Network (I2N) fuels the success of innovators and entrepreneurs to build great businesses by connecting them with community, coaching, customers and capital. We do this through a range of programs across our I2N Hubs at Hunter Street, Williamtown, Muswellbrook and Honeysuckle (opening 2020). MaRS is the world’s largest urban innovation hub, located in the heart of Canada’s largest and the world’s most diverse city of Toronto. MaRS brings together educators, researchers, social scientists, entrepreneurs and business experts under one roof. Founded by civic leaders MaRS is an entrepreneurial venture designed to bridge the gap between what people need and what the government can provide. UON is proud to be able to bring this program to you at a subsidised rate thanks to the NSW State Government’s Boosting Business Innovation Program.